2. Add cinnamon sticks, cloves, nutmeg and green cardamoms. 3. Saute till they crackle. 4. Add ginger garlic paste and saute again for a few more minutes. 5. Add lamb and onions. 6. Cook on medium heat till the liquid dries. 7. Add salt, red chilli powder, coriander powder, turmeric powder and carrots. 8. Stir in tomato puree and cook till the oil separates. 9. Mix in khoya, onion paste, green peas, mushrooms, cashewnuts, yoghurt and garam masala. 10. Add water and cover the dish with a layer of dough. 11. Reduce heat and cook till the meat is tender and the gravy has thickened. 12. Serve hot accompanied with steamed rice. 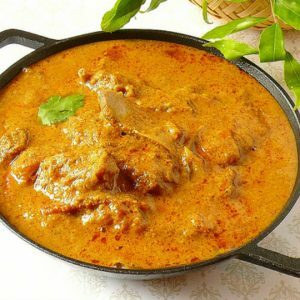 Feel free to comment or share your thoughts on this Baoli Handi (Boneless Lamb in Tomato Puree) Recipe from Awesome Cuisine.